Welcome to Statsguru, ESPN scrum.com's new-look rugby statistics database. 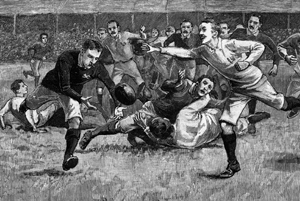 Our unrivalled record of international rugby, produced by statistician Stuart Farmer, includes every Test match ever played plus individual records for every player and thanks to the powerful Statsguru tool you are now able to analyse this wealth of information like never before. To the uninitiated the wealth of information available via Statsguru can be a little daunting so to help you enjoy the experience, and to avoid any confusion, we have clarified the changes the sport has seen over the years and the different interpretations used around the world. Read the explanation. We've tried to make the new engine as user-friendly as possible, but we'd love to hear your comments on it. We welcome all comments and suggestions - via our feedback page.